For South Koreans, Wong Ada is better known as a reality show contestant than a karate practitioner. Wong, who earned popularity on the reality competition show "K-pop Star" in 2014 with her singing talent, is now a karate practitioner representing South Korea at the 18th Asian Games on Saturday. 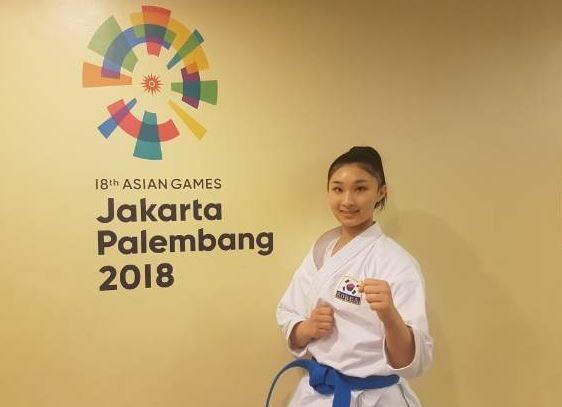 The 17-year-old failed to reach the podium in women's kata, losing 5-0 to Kiyou Shimizu of Japan, the Asiad defending champion and two-time world championship winner, in the first round. She then lost to Grace Lau Mo Sheng of Hong Kong in a repechage bronze match. Wong, who is ranked 163rd in the world, was overwhelmed by Shimizu from the start. "I had a mental breakdown when I saw the bracket," Wong said. "She was a world champion. It was my first Asian Games, and I tried my best, but she was just too strong." Like taekwondo poomsae, karate kata is non-sparring event in which practitioners demonstrate the Japanese martial art's patterns and movements. "I turned my back and didn't watch Shimizu's performance," she said. "I had to focus on my game and moves that I prepared." Wong, born in New Zealand to a South Korean mother and a Hong Kong father, started karate at age six. When Wong was a participant on "K-Pop Star," where she nearly made the top 10, she was introduced as a "karate girl." "I just fell into karate by accident after going to a karate gym with my friend," she said. "People got to know about karate through me when I appeared on the show." When asked about representing her mother's land, Wong said she is just "honored." "My parents just told me to do my best and show my thing," she said. "My father doesn't have anything to say about me representing my mother's country. I'm just happy that I can compete for my mother's country." Wong said her next goal is to compete at the 2020 Tokyo Olympics in Japan, the birthplace of karate.